Superheroes are not going anywhere in terms of popularity, with Marvel seemingly already having planned out the next century of lycra clad hero movies, and DC doing their best to keep up with their own universe. As is often the case, the world of online casino play has tried its hardest to take full advantage of the opportunity by employing superheroes in as many ways as possible. One online casino to take the idea in something of a new direction is Vegas Hero, and by new direction, we mean no real direction at all. Coming from Genesis Global Limited, who are responsible for the impressive Casino Cruise, and the entertaining Spinit Casino, players have the right to expect a lot here, but from the outset, it doesn’t feel like they’re going to get it. “Vegas Hero stands as a pillar of hope” crows the homepage, before going on to explain that the hope in question is for online slots, table games, and promotions, things that, in our experience (and probably yours too) tend to not be in short supply at online casinos. 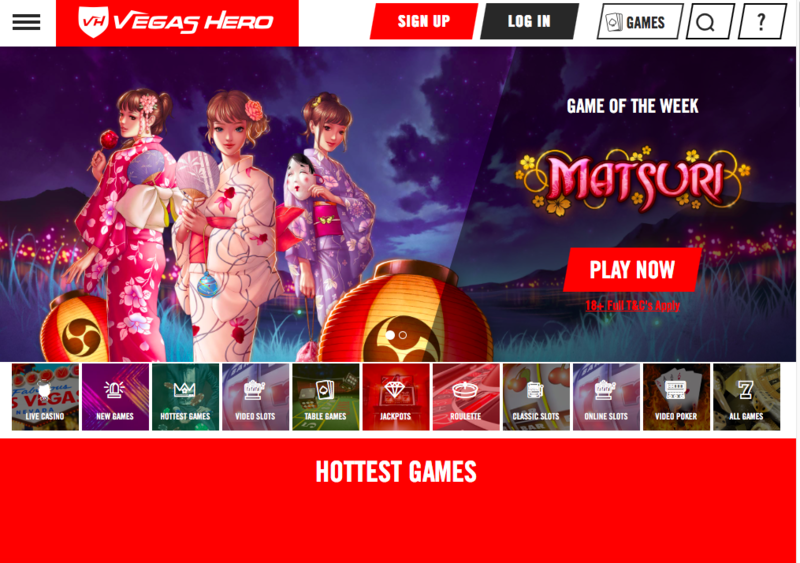 The high octane nature of the banner across the top of the homepage initially gives the impression that Vegas Hero is going to be a striking, immersive online casino, but the site soon crumples under the weight of that expectation. While the suited casino player in full superhero pose, looking smug in front of all the Vegas landmarks looks great, it’s about all there is in terms of original design here. Scroll past that banner, which also advertises the welcome bonus mentioned earlier, and you’ll be met with a plain, white background for the rest of Vegas Hero. This is a shame, because this is a site that gets off to a good start in terms of design, but the decision seems to have been made that this alone would be enough, and that decision was wrong. Navigation is simple enough, there is an abundance of thumbnails that allow instant access to popular games and all information about bonuses, promotions, terms, and the Vegas Hero site itself is easy enough to find, but it’s not enough. Online casinos need to stand out, and while the banner here does, there needs to be more, and there isn’t. 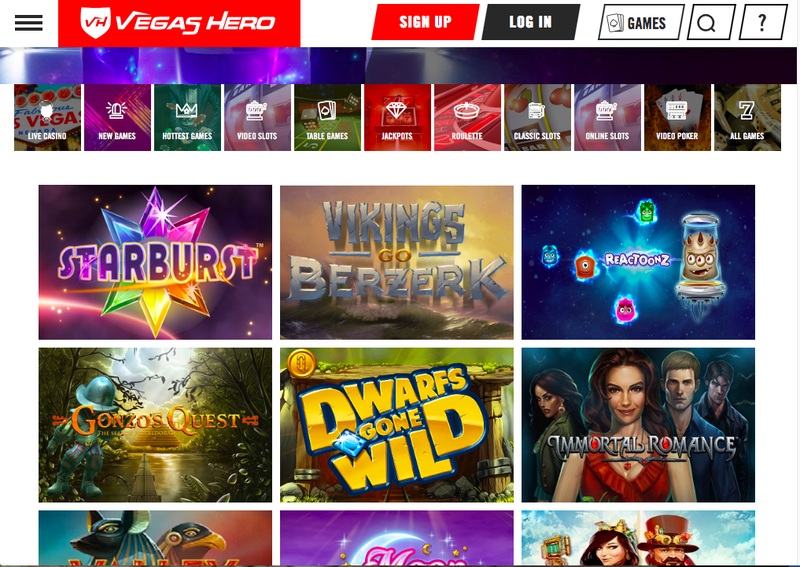 Vegas Hero is one of those odd online casinos that has more games than most, coming from a smaller list of software developers than we’d normally expect. While there’s in excess of 1,000 games available here, enough to stand up with the majority of established casinos, they only come from Evolution, Microgaming, NetEnt, Play'n GO, Quickspin, SG Digital, and Yggdrasil. These are all top-quality developers, in fact, they could arguably be the very best in the business right now, but the lack of other well-known names like Playtech means there are some glaring omissions in the collection. While there are more games than you could possibly know what to do with available here, if you come looking for something specific, there’s no guarantee that you’re going to find it due to the absence of a few high profile developers, and almost all of the up and comers who are making their name in the iGaming world. All in all, Vegas Hero can’t stand up to other sites on its own network, let alone compete with the giants of the industry.